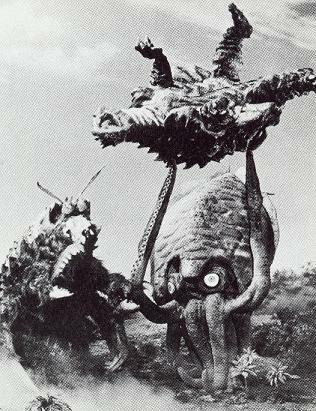 There are many Toho Studio monster movies that don't star Godzilla. Much as I'd love to review every Godzilla movie for you and highlight the best (all in good time), I feel that the non-Godzilla films get far less coverage, and I'm shocked and pleasantly surprised that such a rare item is out on DVD. 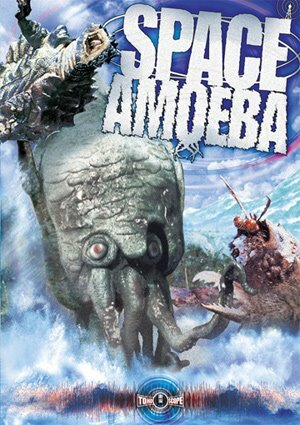 Space Amoeba has finally been released widescreen (2.35) in Japanese, after years of having the picture cropped and the dialogue dubbed. Cause for celebration and reappraisal - it's a good, clean, fun (man in a suit) monster movie! even sillier names for its release in the west. Despite the title and even sillier publicity stills, Space Amoeba has an A-list production crew. Directed by Ishiro Honda no less - the director of the original Godzilla film (Gojira, 1954) and the best of Japan's sci-fi films over three decades. Honda directed one last Godzilla film after this, Terror of Mechagodzilla (1975), then semi-retired to TV work. But he returned to assist his long-time friend Akira Kurosawa on Kagemusha, Ran and Dreams. After a title sequence that teases us with close-ups of the movie's three monsters, the opening shot is a startlingly modern image - the silhouette of an Apollo-like space rocket against a huge sunrise. Instantly I was reminded by the coincidental (?) opening shot of William Peter Blatty's black comedy The Ninth Configuration (1980). Enter young, trendy photographer Kudo, on the trail of the missing probe - he saw it land but no one believes him. He tags along with an expedition to the island, where a report comes in that a Japanese explorer has been snatched by a giant squid! This of course is at a time decades before giant squid were known to exist. The team discover that some thing from deep space has come to the island with the probe, and is trying to assimilate itself into different lifeforms on the island. 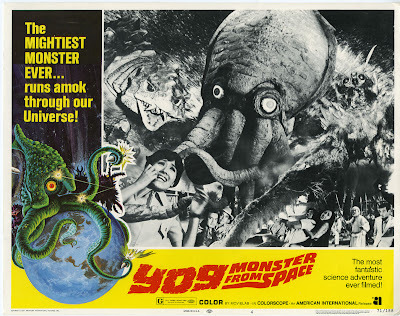 While this is more of an excuse for a giant squid, a giant crab and a giant turtle to run around terrifying people, the plot is probably derived from the 'blob from space' scenario first posed by writer Nigel Kneale in The Quatermass Experiment. Indeed, the scene of the amoeba entering the capsule in space is something I imagined occuring, but was never explicitly shown, in the original Hammer film. The 'invasion from space' plot, together with a sub-plot about industrial espionage on the island, is strong enough to keep us interested in the human characters. This is very rare in giant monster movies, and a credit to the cast for making the implausible interesting. Akira Kubo plays the photographer - normally a cleancut astonaut or hero-type, Kubo obviously enjoys letting his hair down, sporting a designer beard, a funky hat, and playing it cool without being obnoxious. The actor is still working today, recently appearing in a Chiaki Kuriyama horror film called Mail. The short-tempered scientist Dr Mida is played by Yoshio Tsuchiya, fresh from starring in the extremely risque, avant-garde Funeral Parade of Roses. The dodgy-dealing Obata, is played by Kenji Sahara, who only ever seemed to act in Toho monster movies, and still is! He was in Godzilla Final Wars (2004). The heart and soul of this party, Ayako, is played by Atsuko Takahashi, who had previously played a beautiful alien (Kilaak!) in another classic monster rally, the Godzilla film Destroy All Monsters (1968). So, we've got a blob who takes over creatures, makes them gigantic and strong and directs them to the native village for some gratuitous destruction of buildings. This of course means that the giant squid has to walk around on land. If you thought that the walking squid in The Calamari Wrestler (2004) looked silly, then what about a walking giant squid. Much fun can been made of Gezora's wobbly walk, but let's face it, most squid are pretty wobbly out of the water. The rubber suit is a lot of fun, and very cleverly filmed so you don't ever see the legs. In fact, it looks pretty much as it should do, but the glowing eyes are a little over the top. Next up is Ganime, a giant crab. (Who comes up with these names?). It gets to fight with Kameba, the giant rock turtle in the spectacular climax - a wonderfully intricate volcano set. My main complaint about the film is that Gezora (the squid) never tangles with the crab or the rock turtle. I was disappointed the first time I saw Space Amoeba for this very reason. Subsequently, I revisited my old books and discovered publicity stills that feature all three monsters fighting with each other (above). I'd been suckered by the publicity - the scene doesn't appear in the film. But this second viewing of the film has kindled new joys. Yes, the monsters are all men in suits, but what fantastic suits. The movements in Ganime's face rivals Predator's ugly mug, many years later. Kameba is a great monster design, again with a convincingly articulated face, and with the fact that he's a man on all fours cleverly hidden. This undemanding monster movie moves swiftly along - lots of action, and a better storyline than most. However when Akira Kubo summarises the plot during the closing scene, even the scriptwriters know how ridiculous it sounds.